I’m slowly catching up with the rest of the BBA Challenge crew, though summer keeps trying to derail my plans. Baking in the summer is always a challenge for me, whether it’s the heat making the kitchen unbearably hot or the distractions of three boys, each with his own agenda. The boys were my distraction during the ciabatta, when means I forgot to snap a photo of the poolish, and the final rise was about double what it should have been. My loaves didn’t stretch quite so well before going into the oven and were much higher than expected even though I dimpled the loaves. One even had a big gaping hole right under the crust. 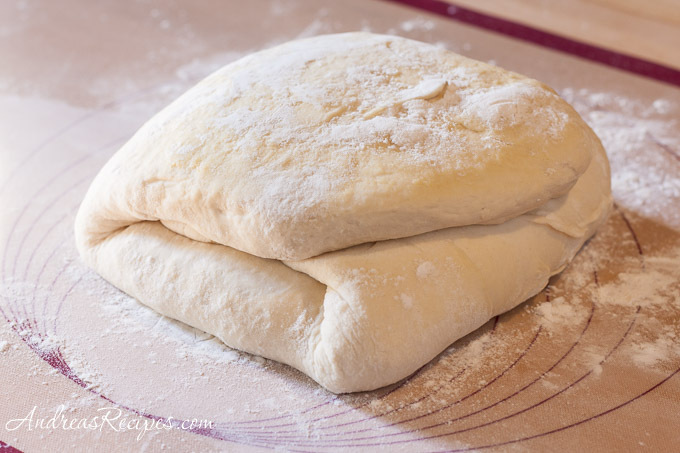 Other than my challenge with over-rising, the ciabatta is not difficult to make and doesn’t require any special skills for shaping. 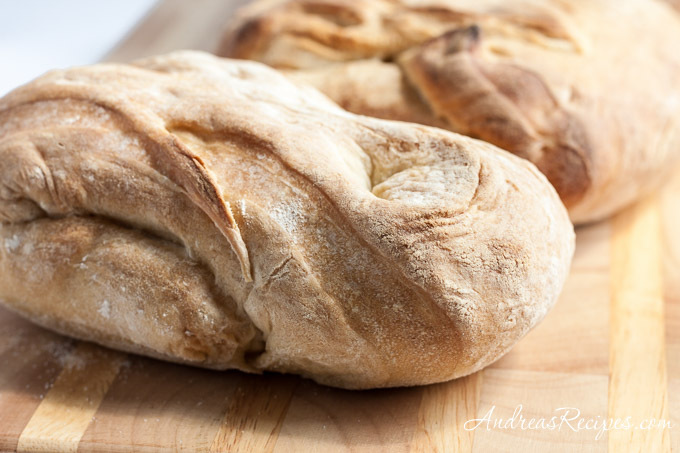 If you can pick up a piece of dough and stretch it, you can make this bread. I chose to use the poolish starter method and left it to sit in the refrigerator for three days before mixing the dough. It bubbled up nicely as it came to room temperature and had a tangy, slightly sour scent. The bread baked up with a hint of sourdough aroma and flavor, a plus in my opinion. 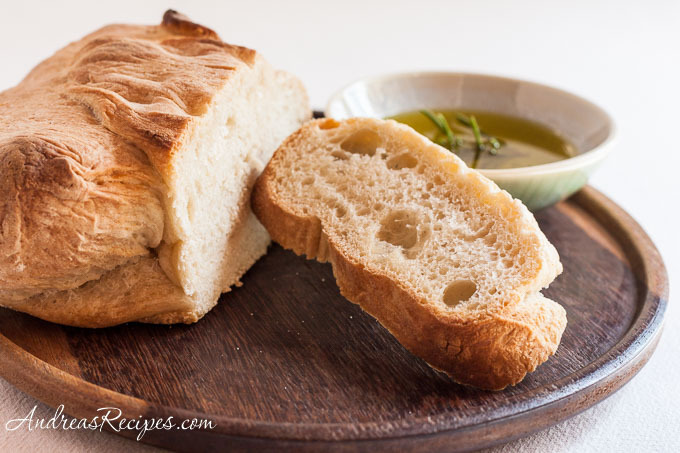 The crust was crispy and the crumb chewy, though I would like to have had more classic ciabatta holes, but supposedly you get more of that when using the biga starter. Thanks as always to Nicole of Pinch My Salt for organizing the BBA Challenge! For more bread inspiration and to see what we have been working on, check out the BBA Challenge photos in the BBA Challenge Flickr photo group. 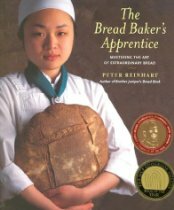 Nicole found a video of Peter Reinhart speaking philosophically about bread on the TED website. My favorite quote from his talk, “Beer is basically liquid bread, or bread is solid beer.” I found the talk very informative and recommend it if you enjoy making bread. Wonderful! That is a type of bread I love!